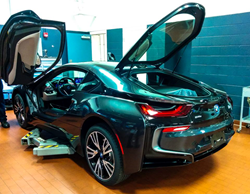 Bill Jacobs BMW of Naperville is excited to announce the arrival of the highly anticipated hybrid 2014 BMW i8 at their dealership located at 2495 Aurora Avenue in Naperville, IL. The BMW i8 is the future of the automotive world. For more information please contact Bill Jacobs BMW at (630) 357-1200 and stay tuned for the second BMW i8 arrival. After nearly 10 years of development, the 2014 BMW i8 has arrived with a cutting-edge, futuristic design. The i8’s vertical-opening doors accentuate its ultra-modern, high-tech build. This groundbreaking Ultimate Driving Machine is a gas-electric plug-in hybrid, powered by a turbocharged three-cylinder combination gasoline engine and 7.1 kWh lithium-ion battery powered electric motor. The system pumps out an impressive 360 horsepower and 420 lb-ft of torque, and continues to deliver the Ultimate BMW performance that enthusiasts expect. The i8 is two-seat supercar like nothing else on the road today—especially in the hybrid vehicle segment. Apart from the sleek design and powerful engines that can accelerate this machine from 0-60 in an estimated 4.4 seconds, the most exciting element of the BMW i8 is its remarkable range. The i8 can achieve up to 112 mpg with a range of up to 372 miles—far above many of the electric plug-in hybrids available on the market today. In electric mode, the BMW i8’s top speed is governed to a modest 75 mph. When opened up into sport mode, the gasoline engine can propel the vehicle to a top speed of 155 mph. The i8’s firm suspension and stiff chassis provide a proper platform to take full advantage of its extraordinary performance. The interior of the i8 interior is artistically futuristic. Luxury radiates from every part of the i8, with stitched leather, premium materials and stylish paddle shifters. There is no denying that this vehicle is still 100% BMW. The BMW i8 is the future of the automotive world. For more information, please contact Bill Jacobs BMW at (630) 357-1200 and stay tuned for the second BMW i8 arrival at http://www.billjacobsbmw.com. As one of the largest BMW dealerships in the Chicagoland area, Bill Jacobs BMW is fully committed to creating a shopping experience for their customers that matches the luxury products they represent. In keeping with the Bill Jacobs tradition, they promise to provide a customer-friendly purchasing experience, as well as a responsive and reliable experience in their service department. With over 50 years in the automotive business, Bill Jacobs BMW is a name you can trust.